Robert Broadbooks serves as the Regional Director for the USA/Canada Region of the Church of the Nazarene, a position he has held since 2008. Dr. Broadbooks was born into the Church of the Nazarene in Nebraska and is an ordained elder. Prior to his work for the Global Church of the Nazarene, he served as district superintendent of the Tennessee District for 6 years and the Alabama North District for 6 years. Each district moved forward under his leadership. Of particular satisfaction for him has been his involvement in the planting of 24 churches while serving as superintendent (8 Latino, 9 Anglo, 6 Black, 1 Korean). For 20 years, Dr. Broadbooks served as pastor in four growing churches: Montrose First, Colorado; Denver Lakewood, Colorado; Hutchinson First, Kansas; and Tampa First, Florida. He has a B.A. from MidAmerica Nazarene University, 1973; a M.Div. from Nazarene Theological Seminary, 1976; and a D.D. from MidAmerica Nazarene University, 2000. 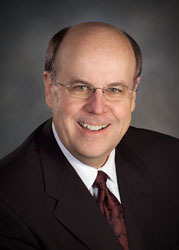 He has served on numerous local, district, and general church committees and boards. He enjoys both preaching and writing and has contributed to several periodicals. His books, From Pastor to Pastor: Letters of Encouragement and Wisdom and How to Bless Your Pastor, were released in 2003 and 2010 from Nazarene Publishing House. Created for Mission: Effective Models for Districts and Leaders was written with Gustavo Crocker and released in 2011. His wife, the former Carol Renee Powers, has been actively involved throughout all these ministry experiences. She has a love for scripture memorization, intercessory prayer, and speaking to ladies’ groups. She graduated from MidAmerica Nazarene University with a degree in elementary education. The Broadbooks have two children. Daughter Keely and her husband, Matthew Mullins, graduated from Trevecca Nazarene University and currently reside in Nashville, Tennessee, with their two sons, Maxwell and Malcolm. Son Lincoln Broadbooks and his wife, Danielle, graduated from MidAmerica Nazarene University and reside in Olathe, Kansas, with their two daughters, Effie and CeCe.